E2 401 Non smoking/ Must be 25+ to book/No pets Cute third row home with 4 bedrooms and 2 bathrooms. 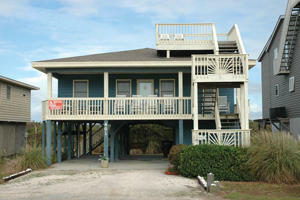 Just a block from the ocean, you have wonderful Atlantic views and easy access to the beach. There are bedrooms on each side of home shares a full bath. This home boasts many amenities that include ceiling fans, microwave, washer & dryer, dishwasher, color cable TVs, DVD & surround sound. Amenities also include a covered porch, picnic table, double swing under the house, outside shower and widow's watch. NO SMOKING, NO PETS. BEDS: 1Queen, 1Bunk & 1Single, 1Queen, 1Bunk & 1Single. 4 parking spaces. We Loved the house and the kitchen was fully stocked with great appliances and cookwear!! It was perfect for our family of 10!! Great location with easy beach access. Nice kitchen with a lot of storage!